The Clover D16A is the perfect bottle free solution for any high end office or residential location that needs a high-capacity (750-gallon) water tank. The two tone black and stainless steel finish is stylish and has a special zinc coating that wont finger print so you enjoy easy clean up. 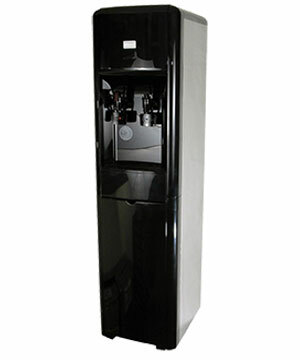 It comes with a dual float safety shut off system, hot/ cold output, stainless steel tanks and paddle style faucets. Clover D16A is durable enough to withstand years of abuse and heavy traffic and has a whisper-quiet running sound. Enjoy crisp, clean, chilled drinking water anytime using the cold water push faucet. • Temperature Adjustment: Controlled by an adjustable thermostat, the cold water temperature can be set from around 35.6°F-53.6°F. The hot water temperature is automatically controlled (non-adjustable) to nearly 185°F. • Hot Water Thermostat: Yes - temperature is controlled to 185° F.